 Alfred Manufacturing was founded in 1948 upon those words. Over the last 64 years, our family-owned company has excelled at providing outstanding quality to our customers by staying true to that philosophy. Today, Alfred is your one-stop shop for stamped, plastic injection molded, machined and assembled products. But in order to understand where we are now, it’s important to know our roots. We’ve grown by leaps and bounds since our beginnings. Originally three employees in a 1,600 sq. ft. plant, Alfred expanded to eight employees and relocated into a 4,000 sq. ft. facility in 1956. In 1985, Alfred Manufacturing purchased Accutool Precision Machining, greatly expanding our foothold in the Aerospace and Defense industries. Accutool has been a supplier to Aerospace and Department of Defense since 1962, with MIL-I-45208A status and MIL-STD-45662 approval by numerous prime contractors. Our new Accutool Division moved into our current plant location, further enhancing our ability to expand into new customer markets. The third generation of the Alfred family joined us in 1987. Greg Alfred has helped guide the company’s management team through yet another phase of technological growth and expansion. In 1990, we expanded into prototype and production injection molds and molding, opening our plastics division to further meet our customer’s needs. Today, our company has three main divisions: Metal Stamping, Injection Molding, and Precision Machining. With over 120 employees occupying over 75,000 square feet of plant space, we offer our customers a full spectrum of manufacturing, fulfillment and supply chain management capabilities. We are ISO-9000 certified, and we’re committed to using the most up-to-date techniques. We meet deadlines and exceed expectations. Let us show you what Alfred can do for you.